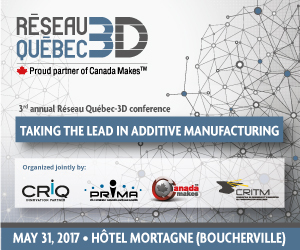 On May 31, 2017 the Third Annual Réseau Québec-3D Third Conference will be held in Boucherville with the theme: “Taking the Lead in Additive Manufacturing”. Join more than 300 participants and some 20 exhibitors for this third edition of Réseau Québec-3D’s annual conference, in collaboration with CRIQ, PRIMA QC, Canada Makes and CRITM. At this event you will have the opportunity to attend talks by international presenters, including GE Additive and AddUp (Fives-Michelin), as well as Québec leaders in additive manufacturing. Don’t miss this opportunity to interact with businesses from here and elsewhere that have demonstrated expertise throughout the additive manufacturing value chain and to help position Québec and Canada as leaders in this flourishing industry. Click here to consult the program. *Réseau Québec-3D, Canada Makes, PRIMA Québec, and CRITM members can take advantage of the member registration fee. Click here to download the visibility plan. INTERESTED IN PARTICIPATING IN THE EXHIBITORS FAIR? Click here to download the exhibitors fair flyer. Hôtel Mortagne offers participants a special rate of $165 per night. To obtain this rate, mention the confirmation number 19943 or indicate you are attending the Annual Réseau Québec-3D Conference. The deadline to take advantage of this rate is May 12, 2017. To reserve: 1-450-655-9966 or toll free: 1-877-655-9966.